As time goes on, you are becoming increasingly independent and your unique personality shines through more and more. You often prefer playing by yourself and sometimes express the slightest bit of annoyance when I try to join in your fun. You move from one toy or activity to the next with purpose, and trying to distract you from your intended task is proving to be a challenge. If you're looking at a book, and I start reading it to you, you'll often lose interest and start flipping through a different one instead. I cherish the times when you nestle into my lap and let me read to you since they are becoming fewer and further between. We don't interfere with your explorations of our home (unless there's a safety issue, of course), and you've started wandering (well, scooting) off into other rooms, leaving us behind to set off on your next adventure. The other day, you went off into the bathroom to engage in one of your favorite past-times: banging the cat's food dish against the sink. This action, in and of itself, was not unusual. What was unusual was that you shut the door behind you, as if to express a desire for some privacy, please. When I retrieved you from the bathroom, you set off for your bedroom, where you've been enjoying pulling every book off of your shelf and emptying your basket of stuffed toys. Things got quiet. 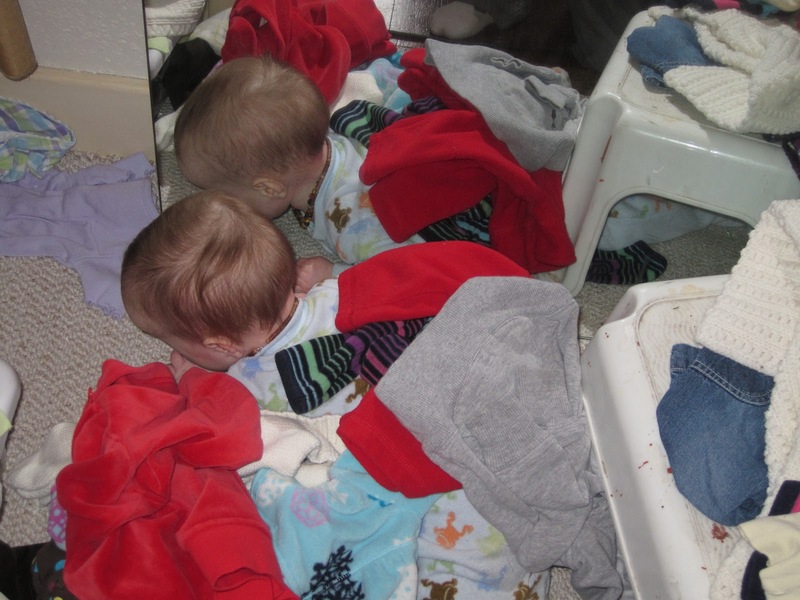 One of the most basic lessons of Babies 101 is that a baby who is quiet is either sleeping or getting into trouble, so I went into your room to check on you. Except...I couldn't find you. Your bedroom is smaller than many people's closets, so I panicked a little bit when I didn't see you upon scanning the room. The only room between the living room where I had been and your bedroom was the kitchen, and you weren't in there, either. Just when I was about to start really worrying, I noticed movement out of the corner of my eye in your closet. You had pulled down a pile of clean clothes that I'd been meaning to hang up in your closet, buried yourself under it, and were rolling around in it and admiring yourself in the mirror. After nearly giving me a heart attack, you nearly killed me with cuteness! While watching you grow and blossom into your own person can by nerve-wracking at times, it is truly one of the greatest joys I've ever beheld. That is so cute. Gorgeous photograph! That age of discovering independence comes round too quickly doesn't it! This is so sweet! I love the pictures of her under the clothes... so cute! Thanks for the visit. Following back. 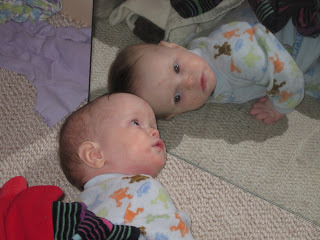 Love the photo of Delilah looking at herself in the mirror, so adorable!